This is an index for tropes about birds in the corvid family (including crows, ravens and magpies). Crows and ravens are intelligent and resourceful birds. Crows are creepy animals, and associated with unpleasant things. When someone does or says something stupid, a crow flies by cawing at them. 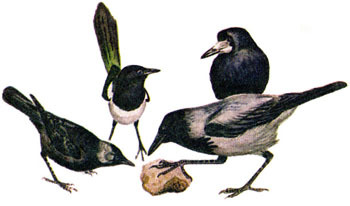 Magpies' behavior can be used to predict the future. A type of Youkai resembling either humanoid crows or red-faced humans with wings..
Magpies are attracted to, and will steal, shiny objects.